Our long time readers know about this obsession of mine. I love them! Here’s a new one that I’ve never published before. 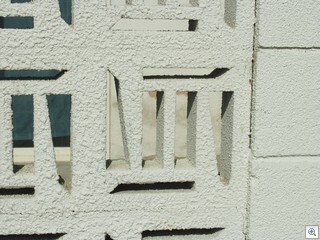 Click here for all the archived posts relating to decorative block. Just to make a point, that if we’re “saving” the neighborhoods and the architecture and the designs of what ever era, we have to do more than just repair the functionality. I think this is why someone should start to make these patterns again. I know I’ve become obsessed with these block designs, but at least it’s one of the many obsessions I can blog about.